What’s The Best Way To Archive Data to the Cloud? NAVA (National Audiovisual Archive of Hungary) constitutes the legal deposit archive of the Hungarian national broadcasters. Its scope of collection comprises the programmes of the national broadcasters produced in or relating to Hungary. In addition, NAVA also maintains special collections by accepting any other audiovisual content facilitating the preservation of audiovisual content as part of the cultural heritage. Digitizing, cataloging, and archiving such a large amount of video is a challenge in itself. But figuring a way to facilitate access to the public as quickly as possible and without a complex workflow made the challenge even greater. Indeed, figuring a way to maintain fast and transparent access to video material that also needs to be transcoded and streamed from the cloud was not obvious. Tiger Bridge proved to be the catalyst that made this demanding workflow possible. NAVA’s basic requirement for Tiger Bridge was to use it as a cloud HSM solution. Tiger Bridge replicates and tiers (i.e. moves) data between local storage and the cloud. When data is tiered, a stub-file (i.e. a metadata pointer) is left on the local storage to maintain transparent access to content that has been moved into the cloud. Stub-files look just like regular files. And even though they occupy merely a few bytes, they report the same file size and access time of the original file. In fact, the only visible difference is the offline attribute that inform users that the content is not local. As soon as a stub-file is opened, the associated data is automatically retrieved from the cloud and put back onto the local storage. As such, and thanks to Tiger Bridge, editors that are responsible for compiling and cataloging the videos that must be archived don’t have to worry about where files are actually located (i.e. in the cloud or on local SSD storage). They simply open a file (which can be a stub-file), seek in it, and get to the end without having to first download the entire file from the cloud. Tiger Bridge allows them to continue using the library management software they were already using locally and familiar with. Over two dozen users gain access to the local storage of Tiger Bridge server through SMB and NFS shares using standard 1GbE connections. 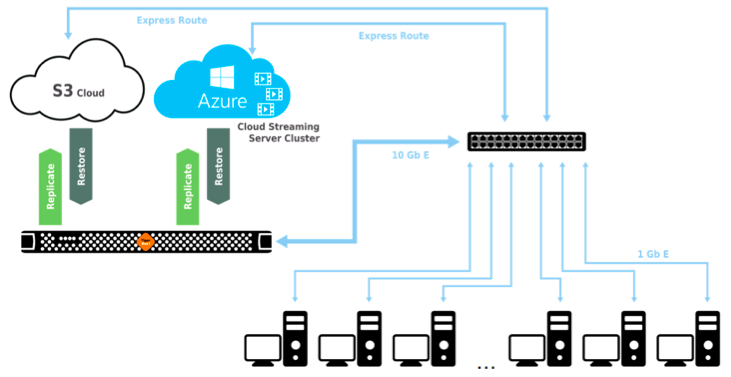 A 10 GbE connection on the server allows NAVA to upload approximately 250 GB of audio and video files to the Microsoft Azure cloud daily. Over 1.2 million multibitrate video files, consuming over 110 TB of storage, have already been uploaded into the cloud. This number is expected to double within the next two years. NAVA uses several containers for their different workflows, e.g. one container for the master files and another for the streaming files, backups, etc. The cloud storage currently consists of Microsoft Azure (hot and cold storage), as well as Interoute object storage that is compatible with the Amazon S3 standard. Tiger Bridge makes it easy for NAVA to access the same files locally or within the cloud. And because the local folder structure is identical to that inside the cloud, it is very easy for NAVA to deploy Blob storages, video transcoders and streaming media services, as well as other analytics, using Microsoft Azure, something that could have proven far more difficult otherwise.